Click here to purchase Artifact or read additional reviews. Brief Synopsis: Lara is an archivist and kicks off the book as a naughty girl - a thief. She managed to steal two precious items from her beloved boss, Hone. It's okay, he died. She flies to her aunt's in Market Harborough to house sit and start a fresh life. She has virtually no family or friends, other than Aunt Catharine, who leaves as soon as she gets there. She spends the next couple of months making friends with the neighbors - a friendly teacher named Kerry and an odd cat named Arama, who she discovers is much closer to her than she could have imagined. The story unfolds and poor Lara is miserable being forced to teach young children art class and trying to avoid the grouchy Arama, who declared her an alcoholic before he even introduced himself. She's about to leave when things start to improve. She gets a job at a local museum assisting with a restoration project that dates back to Bloody Mary, King Henry VIII's daughter...oh and of course, Arama become not so awful. I have to be honest, contemporary fiction isn't my normal genre of choice, I am much more an action packed kind of reader. There were places that moved a little slow for me, but to be fair, this genre always does. I do read it though because I enjoy the character depth that is often not fully developed in the action-adventure reads. There were a couple things I thought were being foreshadowed that never surfaced. I don't want to give any spoilers so not going to elude to what they are. Characters: The characters were well developed with complex histories which we discover as the story unfolds. Their dialogue was fun and the author does a great job of sprinkling humor throughout the story. She made me feel sorry for both Lara and Arama because of their situations growing up, but also allowed me to laugh with them running the gamut of emotions as a contemporary fiction should. Recommendation: This story goes well with hot Earl Grey tea and a rainy day due to the setting in England. The author did a great job with her description of Market Barborough, enabling the reader to transport with Lara. It was well polished with virtually no mistakes. 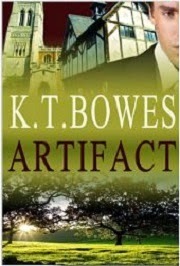 I would recommend Artifact to readers who love contemporary fiction and romance genres with a twist. p.s. if you enjoyed this post, please click the +1 button just below here, so that others may enjoy it, too!